Sikh history has a close connect with the Paonta Sahib Gurdwara. Guru Gobind Singh, the faiths 10th Guru, camped at Nahan for four years till 1685 AD and wrote much of the holy book Dasam Granth here. Foundations of the Gurdwara was laid by the Guru and it still prizes in possessing many of his relics. An imposing dome crowned iconic building on the bank of River Yamuna, the Gurdwara attracts a steady stream of Hindu and Sikh pilgrims everyday. Free meals offered by the Gurdwara are funded by the contributions made by the community towards the upkeep of the place. At Paonta Sahib itself are the Gurdwara Tirgarh Sahib, Gurdwara Bhangani Sahib and Gurdwara Shergarh Sahib. 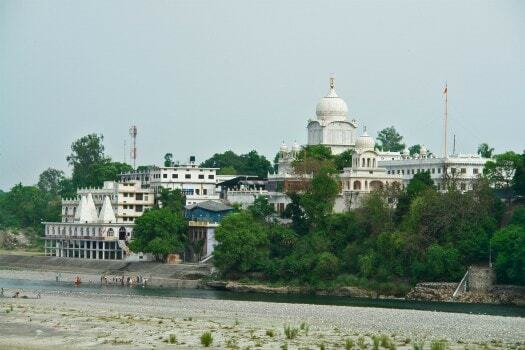 Tirgarh Sahib is located on a hillock from where it is believed Guru Gobind Singh shot arrows at his enemies. Bhangani Sahib is built in memory of Guru’s first battle with Raja Fateh Sahib and Gurdwara Shergarh is constructed at the spot where the tenth Sikh Guru beheaded a maneater tiger with a single sword swipe. Paonta Sahib is 45 km from Nahan, 120 km for Chandigarh and 174 km from Shimla. At Manikaran, placed calmly on the bank of river Parvati with high mountains towering over the valley, is a Gurdwara built in homage to Guru Nanak Dev, founder of the faith who is said to have visited the place with five disciples. The hot sulphur spring in the compound is therapeutic and is known to cure many ailments, especially skin diseases. The place attracts a large number of pilgrims every year. 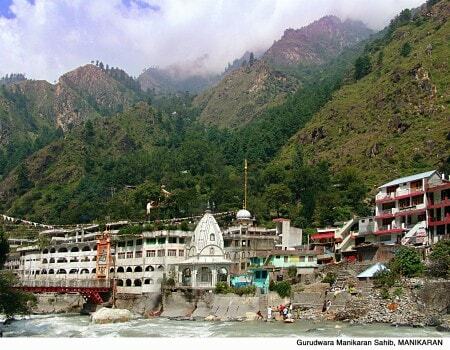 Manikaran, 45 km from Kullu can be easily reached by private of public transport. The scenic hill town around Lake Rewalsar has a historic Gurdwara that was built in 1930 by Raja Joginder Sen of Mandi. The Gurdwara commemorates Guru Gobind Singh’s visit to the place, where he sought to evolve a common strategy with other hill rulers to fight the forces of Mughal emperor Aurangzeb. The gurdwara is beautifully perched on a hillock but what makes it easily recognizable from a distance is the pristine blue color centred around a massive dome.